"Don't you ever get tired of being so positive?" my niece blurted out one day. The question shocked me, five years into my fight with lung cancer. Was my enthusiasm about remaining treatment options so disheartening that even someone normally upbeat struggled to see the hope in my situation? Was the way I was thinking that foreign to how other people think? Over the next year, I came to understand that having cancer had changed more than my body. It had changed how I think. I had grown. Not in spite of cancer, but because of it. Now I treasure every new part of this adventure, as I have learned to not only survive with lung cancer, but to thrive with it. Dann is an extraordinary writer. He has clarity of thought and a level of introspection that rings true, and I believe encapsulates the experience many of my patients have. This book is engaging, thought provoking and emotionally charged. Learning to meet and accept life with joy on life’s terms is no small task. From the plethora of emotions to managing relationships, and from fighting the stigma to becoming your own health care advocate, the writer shows us his road map. I commend this writer for sharing his journey with truth. Second Wind is honest, vulnerable and informative! It will open a lot of eyes about how to advocate for oneself. While anyone with cancer will get a lot out of this book, I wish I could have read it three and a half years ago, when I was first diagnosed. This story is a very good map for beating cancer. It is also an excellent map for living an authentic, fulfilling and loving life. In some of the most intimate ways, Dann reveals who he is. Fantastic start to finish true life story of Tragedy to Triumph! Dann’s personal cancer journey is filled with miracles and overcoming obstacles of getting to the other side. Proof there’s a path to happiness for anyone struggling and/or dealing with adversity (of any sort). Can’t recommend it enough! 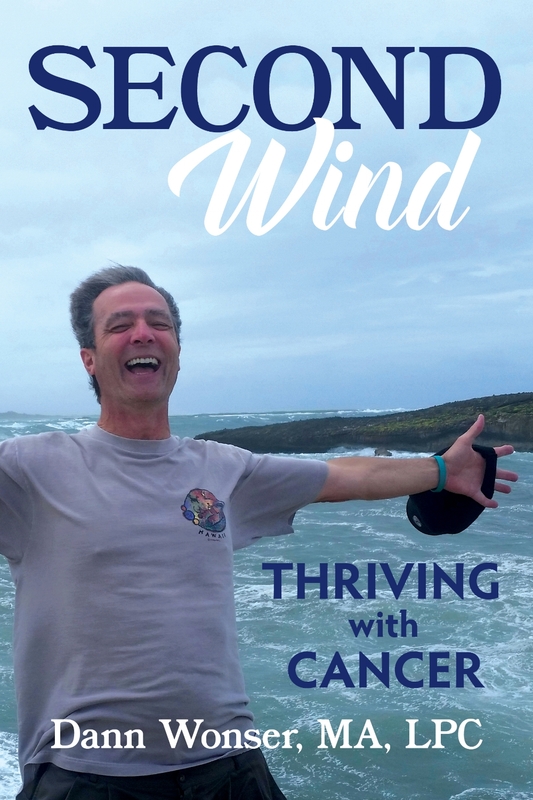 This writer invites you inside all aspects of his emotional, spiritual, and practical life as he goes toe-to-toe with cancer, and comes out a winner. The book is authentic and packed with take-aways. Anyone, with or without cancer, can benefit from reading Second Wind. This is an uplifting read for anyone dealing adversity of any kind. It's honest and relatable, and made me evaluate my own perspective on life. I really enjoyed the optional "challenge exercises" that made me dig deep and access my own outlook. The Book is Coming, and It's Time to Vote! It has taken more than four years of writing, editing, re-writing, more editing, rejection letters, book formatting, marketing plans, blah blah. I went through about four or five titles before I found one that stuck. (The title, Second Wind: Thriving With Cancer, is copyrighted.) And now, FINALLY, I'm close to publishing my book. SO CLOSE! For the final artistic touch, I need your help. I'm trying to choose a cover design, and I am not the most objective person for this task. Which of these two designs do you like? Why? Does one of the designs need tweaking? Tell me what you think it needs. You can include your name or be anonymous - either is fine with me. The most important thing is that I need to hear from you. PLEASE VOTE! Without your input, I may just have to sell the book in a brown paper wrapper with no cover, and I don't want to give people the wrong idea. So tell me, friends and family, which should it be? Or what should change? PLEASE VOTE IN THE COMMENTS RATHER THAN BY EMAIL, so that others can see your comments, and be bold enough to vote themselves.